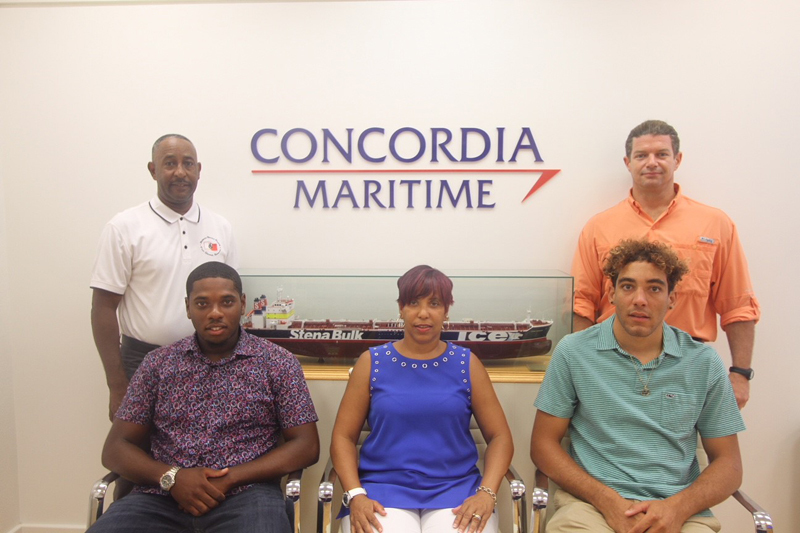 The Concordia Maritime [Bermuda] Ltd. scholarship awards were presented to Lamar Samuels and Andre Durham Jr. to assist in their maritime studies overseas. “Lamar Samuels will study a Foundation Degree in Marine Engineering at South Tyneside College. He has been awarded a three-year scholarship and his first award will be in the amount of $2,750.00,” the company said. “During the past three years Lamar has been employed as a Watch Leader on board the Spirit of Bermuda where he has gained valuable work experience and completed several international voyages and local charters. “Lamar stated that his time working on the Spirit has helped him to develop professionally and he had an opportunity to receive excellent seaman’s training that he believes will assist him in his studies at South Tyneside College. “Andre Durham Jr. will be pursuing higher education and looking to gain a qualification that will assist his career goal of starting his own charter business. He will commence the Associate in Applied Science in Nautical Science programme from Northeastern Maritime Institute in September. Presenting the awards, Angelique Burgess, General Manager for Concordia Maritime [Bermuda] Ltd. said the scholarship committee are pleased to award the scholarships to the two young gentlemen and we wish them much success in their academic endeavours. Concordia Maritime [Bermuda] Ltd. allocates a total of $10,000.00 in scholarship funds each year. Joshua Santucci-Smith was awarded a three-year scholarship in 2016 and is attending the University of Tampa. Alexander Cook was awarded a three-year scholarship in 2017 and is studying at Cardiff University. Apart from providing funds to deserving students, the Scholarship Committee also provide mentorship to the recipients throughout the duration of their scholarship. The Committee consists of: Angelique Burgess, Catharine Lymbery, Taran Card and Mario Thompson. Congratulations to the winners – particularity Lamar who I sailed with on the Spirit and who has a passion for the sea, and I am confident will excel at his maritime studies. Well deserved mate. Congrats to both young men. Lamar so proud of you. I have seen you grow to be very focused on your career. Reach for the stars and beyond you can do it. Always put your best foot forward. Thank you Concordia Scholarship Committee for keeping our heritage alive.